Join us for Cologne’s first multi-lingual spoken word / open – stage event! Bring your words, your songs, your comedy, your poetry to our stage – all languages are welcome. Sign-Up at the event itself, performances can take up to 6 minutes. 1) Come to us between 19:00 and 19:15 and tell us your name we will put you on the list. At 19:20 we will start and call you to the stage randomly. 2) If you didn‘t plan to perform but decide later to go on stage: Again just come to us during the event and tell us your name. Important note: If you want tp sing and need muisc, but dont want to play the guitar it would be easiest if your music was easily accessible online! 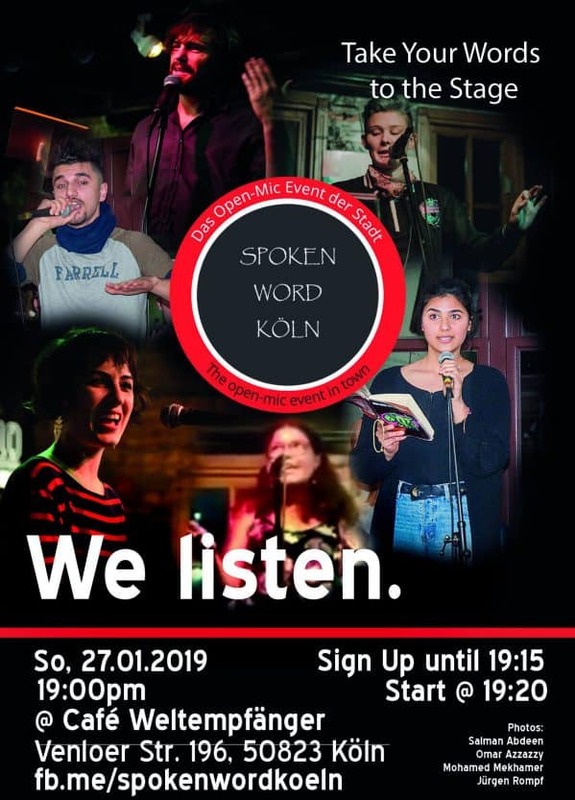 Spoken Word Köln is a sister event to Spoken Word Istanbul (itself offspring of Spoken Word Paris), where Spoken Worders meet weekly to share their passions, their laughter, their emotions and their art on the stage. Spoken Word is a community that welcomes anyone regardless of language, race, sexuality and gender.